I ordered something recently, on-line, on a whim, a new iPhone case. I paid in UK pounds (£) there was no immediate clue that the site was anything other than a normal UK supplier selling something to people in the UK. What pisses me off is how this is so much not the case. It seems it was a US company, and I know things can get from US, or almost anywhere in the world, to here, in a day or two, but they picked the slowest means to send to me on the planet from what I can see. 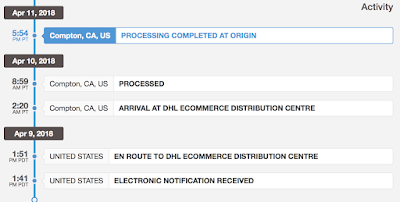 They seem to have used DHL (which people will know how I am unimpressed with them) and some sort of service that is slower than slow - delivered by snails. This is an item ordered and paid for on 7th. It is now 13th, and the damn thing is still in the US, FFS. What is worse, there is a chance I end up with some damn duty or VAT bill to pay on top. I just went to a web site - saw an item listed in £ and paid, why the hell is any of this my problem now? All I can say is it better be a damn good phone case when it gets here!!! P.P.S. It promptly broke, so I have a spigen one now, much nicer. Maybe it’s being held up by Dr Dre, Snoop or Eazy-E in the City of Compton. What a scam. Can’t stand it when websites mislead like that. It could easily be worse. Amazon are normally really good at this stuff, just like they're really good at customer service, except when they're not. I ordered a Kindle Oasis when it came out in 2015: expensive device, so i bought the expensive warranty. Now this device has a stunning six-hour battery life without its case (which contains a much larger battery), so it's almost useless without it, and the case is an integrated part of the product, always shipped with it and with actual DRM on the charging pins to stop you plugging in a non-Amazon case, and the case is going to be the first thing damaged any time you drop it or anything, so obviously you'd think the insurance covered that as well? Plus of course when Amazon came out with their new larger Oasis they discontinued the old one, and also stopped selling the charging cases, so you can't even buy a replacement any more. But that's OK, they still sell them in the US! Except the case contains a battery so they won't ship it to the UK because obviously a 1800mAh li-ion battery, shipped empty, is a simply massive explosion risk. So when my case finally got too smashed up by multiple accidents over years I had to get a friend of mine in the US to get her husband to more or less smuggle the replacement into the country (he came by air, of course). This is all really rather bloody stupid and in any sane world should not be necessary, but it is. Whether the battery is fully charged or not doesn't make a difference. According to wikipedia, "At 15:15 the EICAS message FIRE MAIN DK FWD appeared on the upper EICAS display, and the crew reported the fire..."
Now, I don't know the exact cost of a big aeroplane, but I'm assuming it's many millions of pounds. Why, therefore, do they have computer systems which present the user with such a cryptic message. "FIRE MAIN DK FWD"... I would have expected a much more "plain English" message than that, possibly also with some appropriate icons and eye-catching imagery. "FIRE MAIN DK FWD" looks like the sort of unhelpful feedback message one might expect from a 1970's mainframe, or an error message one might extract from a car's on-board diagnostic port using a £5 code reader from eBay. I for one think some of these big aeroplanes need better computers installed in them. Also, did this aeroplane have an automatic fire extinguisher system and if not why not. It's a bit like when they "lose" aeroplans over the ocean and nobody has any clue where they went. Why on earth aren't these big aeroplans continually being pinged and tracked by a satellite? It all seems a bit archaic to me. Well I know almost nothing about aviation and flying, but even I can tell this means "Fire on Main Deck Forward area". I'm sure an expert pilot and captain understand it in a quarter of a second. A big jet is something like £300m, I think. Which is why they hire product experts (i.e. trained pilots) to operate them who know and understand the systems on board. If they mean "Fire on Main Deck Forward area" then why don't they say that. IF MN FRE MN DK FWD THN W NT SY THT. I have succesfully demanded a refund of the import VAT/duty from companies in this scenario on the basis that "the price you advertise is the price I pay and you have now caused me an expected invoice from a courier demanding fees/taxes which are not my problem and about which I know nothing". When I get junk mail, I tear it up and post it back to them in the freepost envelope supplied, after removing my address block and my inentifiable bits. Tee hee hee. So do I... I even returned an unwanted junk credit card application and filled it in signed as Micky Mouse. They then sent me a reply addressed to M Mouse that my application had been refused. That's as good as the time a letting agent quoted me some insane price for their chosen plumber to replace a piece of drain pipe. I replied asking if said plumber was using gold pipe. Letting agent was so dozy that she rang plumber to ask if he's using gold pipe and then replied confirming that, no, it's not gold, only black. You sometimes wonder how dense people are. Sometimes if a tradesman is impolite to me or tries to rip me off, I call them from a throwaway mobile number and pretend to be a very gullible and lucrative customer and get them to drive quite a long way to a non-existent emergency job at an antisocial hour. This is only going to get worse after Brexit day. Much worse. Admittedly we won't have the "revolving VAT" scams which are still going on after 15+ years - odd that Revenue & Customs seem to be the only organisation (bar Italy) in Europe who can't cope with this. Many of your readers won't remember when Customs & Excise (as they were then) routinely seized "suspect" items like Venetian glass as (I quote verbatim) "they're all at it over there aren't they?" We never did get the glassware we purchased on our honeymoon - some scroat at a C&E warehouse had that & they still wanted duty paid. We basically live in a communist country already. The public sector is bigger than the private sector. We all know how useless the public sector is.